Batman #44 makes us reflect on the issue so seriously written, it questions us further on the extent of Bruce Wayne’s philanthropy and his overall zeitgeist on Gotham City and its citizens. Ok, this latest chapter takes place after the Zero Year Bat-event. Yet, it still connects to the current Bat-narrative Scott Snyder currently writes now. 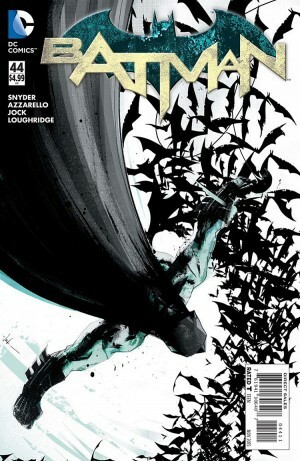 Since superstar artist Greg Capullo takes a well-deserving rest, we are treated with Snyder’s partners-in-crime in Wytches, Jock and Lee Loughridge, plus renowned noir and suspense crime writer Brian Azzarello, who is also an excellent Batman scribe in his own right (i.e. Joker and the upcoming The Dark Knight III: Master Race). The title of this chapter, “A Simple Case”, should be treated and read with great care for both Snyder and Azzarello know how to craft a deceptively “simple” Batman-crime tale. Furthermore, as I repeat once more, you may view Batman quite differently after reading this. So be warned. Anyways, Snyder is responsible for the overall tale, and he and Brian do the scripts, dialogues and breakdowns about a wayward adolescent’s “murder” case. In true Scott’s narrative fashion, words spoken are the keys of fully comprehending this stand-alone tale, and Brian’s more subtle and eloquent dialogues (if you can distinguish these) are matched on the connectivity of the lad’s background, motivations and other forces that led to the first pages. Similar to the veteran’s critically acclaimed series 100 Bullets and Lex Luthor, this issue needs to be read slowly and if necessary, repeatedly to gain the benefits of reading dark, gritty, cerebral and thought-provoking noir narrative. Snyder’s overall writing may mark prominently, but Azzarello’s storytelling is something to be reckoned with. Quite indeed, the Snyder-Azzarello fusion emerges something potent in the overall characterization of Bruce Wayne towards his people, his city, and ultimately, as Batman. The deconstruction of the billionaire’s ulterior motives is being explored, analyzed, dissected, and subtlety condemned while the Dark Knight searches and interrogates. This kind of narration is similar to the exploration of the SELF, except in reverse, in the suspects and leads’ perspectives. Moreover, even Gotham City seems to participate in articulating the roots of its continuing decay despite the Caped Crusader’s heroism and sacrifices. Snyder and Azzarello do a sort of psychoanalyzing Wayne’s consciousness in the most cerebral method yet. The writers/plotters’ literary geniuses are equally matched with the artistic fusion of Jock and Lee Loughridge. If you recall their Wytches synchronization, then once again, they execute their distinctive artistic collaboration in this chapter. Jock’s dark, gritty, minimalist, and scratchy art compliments to the Scott-Brian crime mystery to the point his illustrations carry the heavier lifting in order for readers to grasp the subliminal messages this issue wants to convey. Painstaking even so far, the fact that he draws newspaper articles that serves as an important jigsaw puzzle piece in understanding how complex and intricate Batman handles the case, and his supposed shortcomings as well. Even though his art style is highly eclectic, he finds the effort of intricately drawing detailed close-ups whenever the plot or setting demands, particularly the faces of a certain crime lord, some suspects and the victim himself. Finally, Lee’s colors are significantly crucial in reading and analyzing Batman #44. Though neither as vibrant nor colorful as Scott William’s, Loughridge’s colors play importantly in the grand story for these distinguish the dynamism of the characters’ respective narratives and perspectives, and differentiates further between the past events to the present times. For examples, whenever the lad was involved, warm colors are applied; while the current findings are presented in stark contrasts to signify the bittersweet feeling the case brings upon the Dark Knight. However, even though this latest case study is a terrific work of art, it still has share of Achilles tendons. Primarily speaking, this story demands a repeating reading or multiple if you still fail to comprehend the Snyder-Azzarello narrative fusion. This is an intelligent and even a reflective Batman visual literature that rarely appears in comic shelves, and most probably it may be the last one (hopefully not, but who knows exactly what the future is in-stored anyway) of its kind. And, Jock’s artistic style may turn-off some readers who are accustomed to the hyper-kinetic and vibrant projection of mainstream superhero. It is a question of personal taste, but Jock’s art works so well in the dark and to the mysterious. This goes also to Loughridge’s colors. 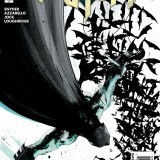 After it is said and done, Batman #44 is one of the best superhero standalone comics for this year. Scott and Brian craft a psychoanalytical and reflective tale of the Dark Knight that fuses with their signature noir and detective storytelling that point out the frailties of the supposedly powerful figure. It is a fact that this kind of exploration is nothing novel at all, but the current creative team enhances that discourse, resulting of producing a rare visual literary gem.